This is a great gift idea, especially with Fathers' Day coming up! Wouldn't Grandpa like one of these? They can also make a great graduation gift. This is for my sister-in-law, so I added the pearl. Or maybe you know a new driver? There are so many options to personalize them! I will also say that I have never made any sort of jewelry before starting on these washer projects, so if I make them...so can you! 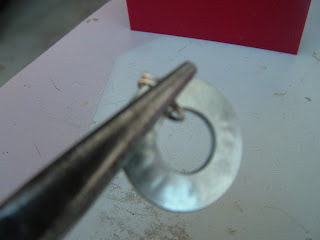 For instructions on how to stamp the washers, see my post here. 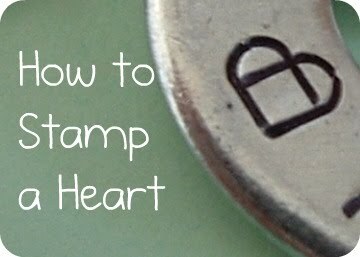 You can order the stamping set from Harbor Freight online for $5 (plus $7 shipping). 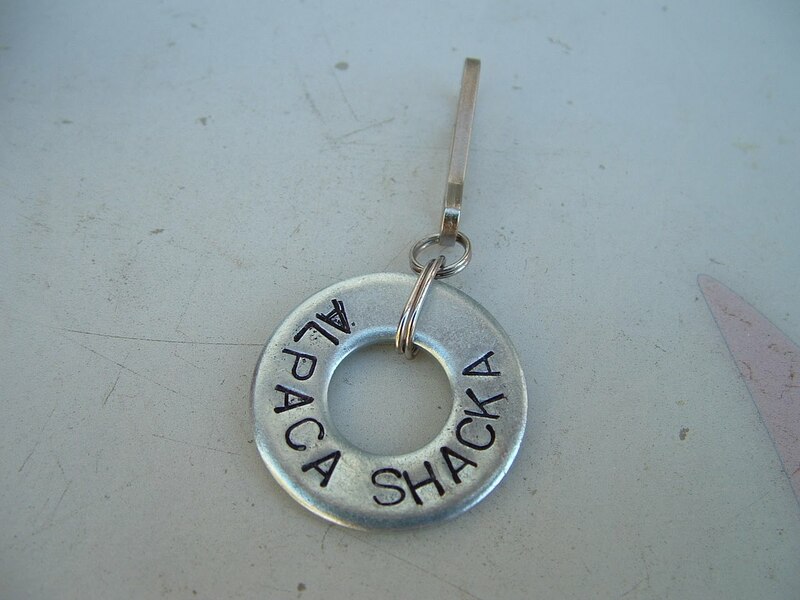 I've also decided to open up a little Big Cartel Shop where you can order 4 custom stamped washers for $1.50 plus shipping and handling if you'd rather have someone else do the stamping for you. New Note: Because of several inquiries, I've added some custom made key chains to my new shop as well, if you want to order them already assembled. Here's what you'll need for a basic key chain: A stamped washer, needlenose pliers, a clippy or keychain, and two little ring things. 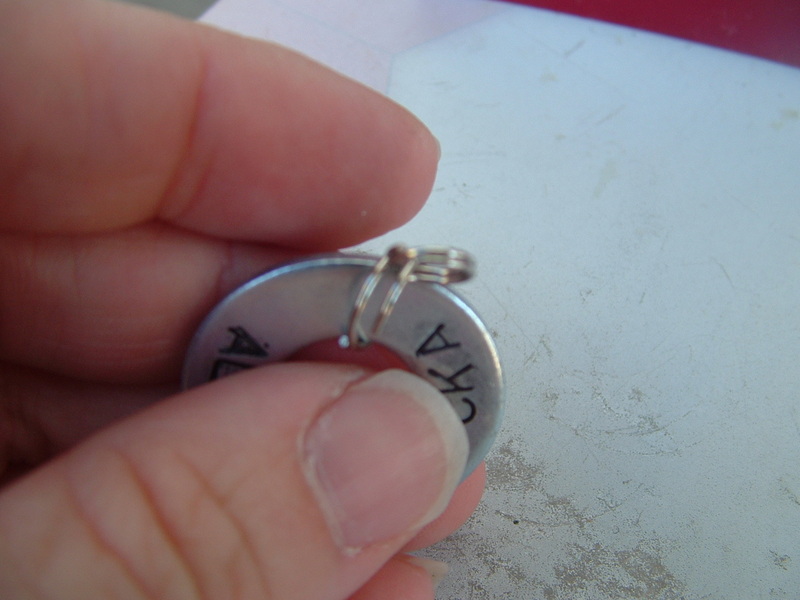 (Like I said...I don't usually make jewelry, so I don't know the technical names for these.) I got the little ring things in a pack with about 100 in them at Wal-Mart and the clippy thing came in a back of about 100 assorted clippy and keychain rings of assorted shapes and sizes at Wal-Mart. 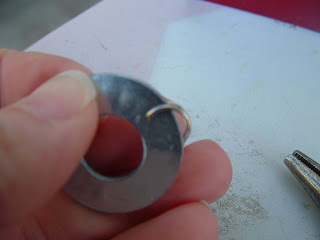 I used a larger one to go around the washer and a smaller one to attach it to the clippy, but you could use the same size as long as one will fit around the washer. These tiny rings are a lot like key chain rings...they wrapped around double and you slide the things through them. 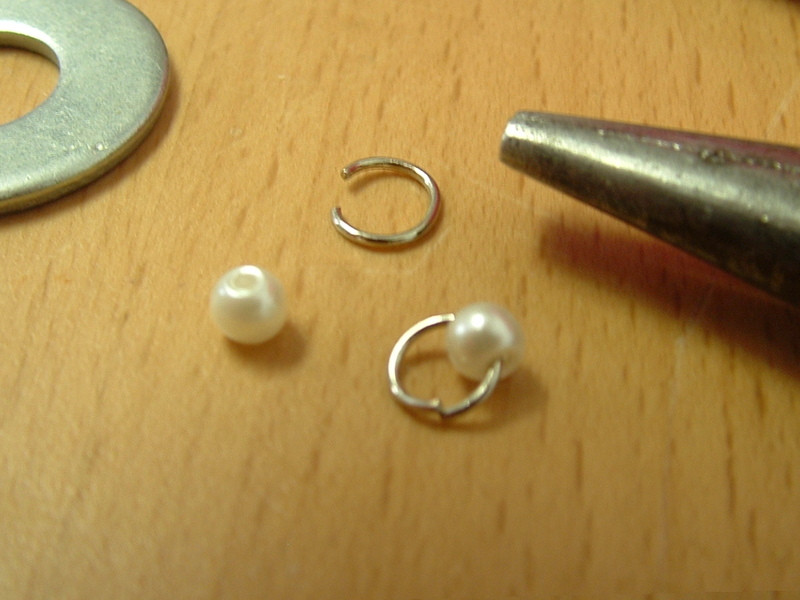 If you want to girly it up a little by putting a pearl in the middle, you'll also need a single ring that opens and a small bead. Put the bigger ring onto the washer. My ring was a tight fit, so I had to use the pliers to coax it around a bit. If you're going a double washer key chain, like some of those shown above, you'll want to put the ring around both of them at the same time. It may bend it out of shape just slightly, but that's okay. It will mostly snap back into shape once it's on. 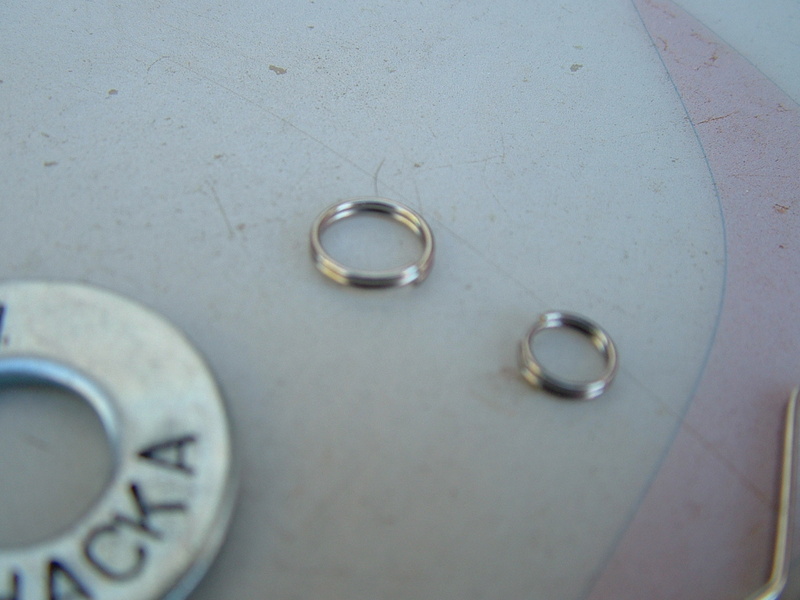 Slide the little ring onto the bigger ring. If you want to girly it up a bit with a second little ring with a pearl, this is also the time to add that. 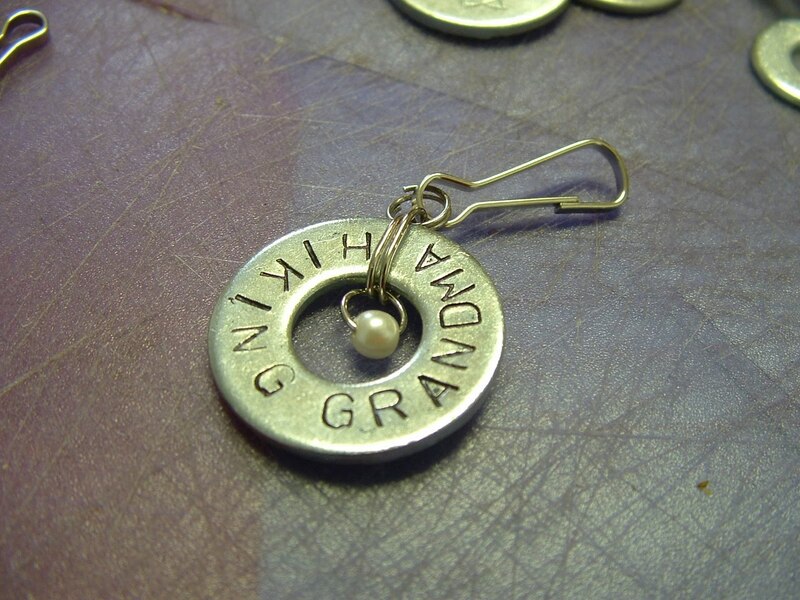 For this I used a ring that could be bent open with the pliers, put a pearl (from a broken bracelet) on it, and closed the loop back up with the pliers. Then because it was such a tight fit with my ring on the washer, I took the needlenose pliers and squished it it a bit to make it a flattened ring. Make sure the ends of the ring are toward the back, so they don't show. Then put on your lanyard clip or keychain ring, and you're done! 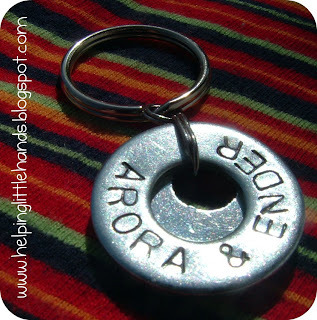 They're perfect as keychains, but also great to add to zippers, backpacks, camping gear, and more! My mom loves to hike and be outdoors, so I made her these for her birthday. And because I love you all and we're almost up to 200 followers, I thought we'd have another little giveaway! 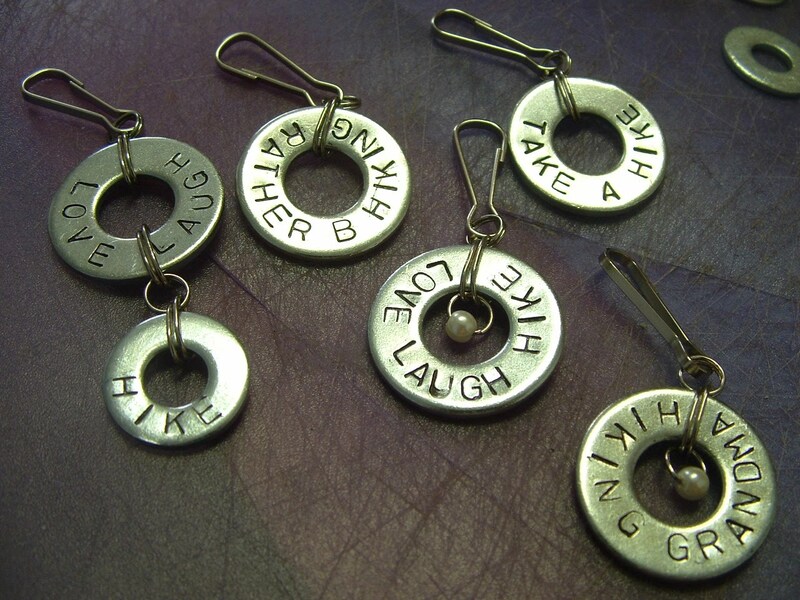 I am GIVING AWAY one Custom Stamped Washer Keychain like any of the examples you see above (with your own message of course)!! Leave a comment for one entry. For a second entry, become a follower and leave another comment telling me you became (or already were) a follower. Giveaway ends Saturday, June 5th at midnight. 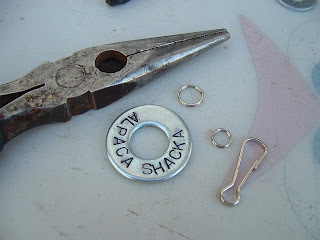 And if you have your own washer projects, link them up here. I love the Dad and Grandpa one!! Thanks!! These are super cool. I told my hubby we need to go to Harbor Freight soon!! I love these! They are awesome!! What a great giveaway!!! I would love to win a customized washer -they are great gifts to give to guys. Our sons are big campers and these would be great on equipment , packs, and clothes. I'm so suprised at how easy & inexpensive these seem to be to make! I'd love to win one for my a fathers day gift! I'm your newest follower..Love your blog..Hope you can pop over to take a peek at my blog & see if anything inspires you for your family/home & become a follower of mine as well. I love all the washer sets.. They are so cute. There's so much you can do with them. I just got my own set to start doing them too. Wow! I love these! I don't even know which one to choose. Cute! Neat project - I'm itching to try this out! polly i love these! i just ordered my own set of alphabet stamps from england for about 20€ i figure it's worth the investement! my in-laws are celebrating their 50th anniversary this summer and we need to come up with 50 gift ideas (there are 5 siblings). this is going to help! I'm now a follower, too! Thanks so much! What a neat project. 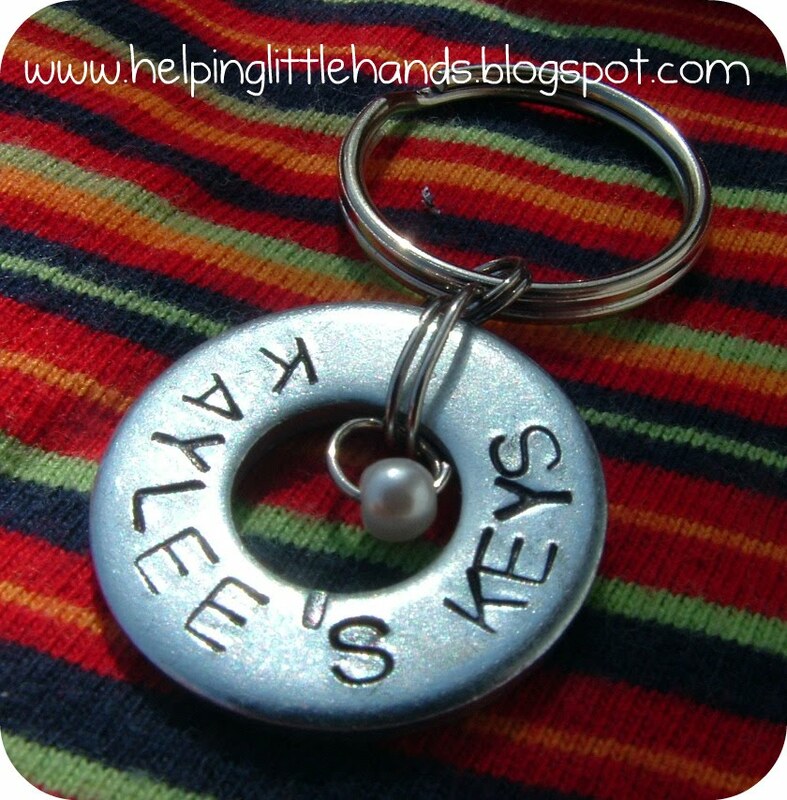 I love the idea of a keychain! Hi, I'm a new follower! Love the personalized washer project!! The blogspot has sooo many great ideas. Thanks for posting! 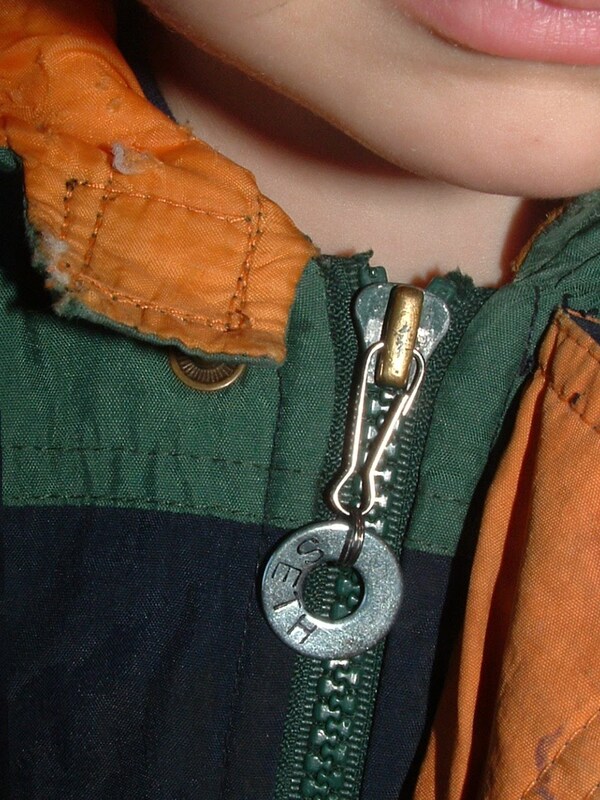 Would LOVE one of these to hold my son close to my heart when I'm away from him at work. How much fun is this....would be perfect for PAPA to have all the grandkiddos names go with him his keys go. OH mannnn. i LOVE them.. mine would say cross my heart. also I am now a follower. 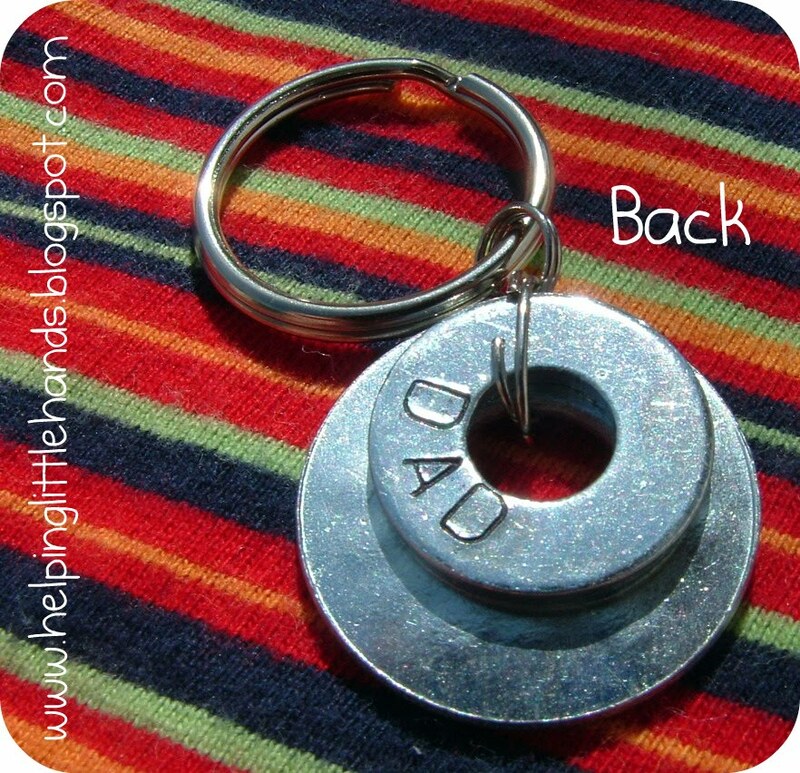 I am so making these for Father's day! Thanks! Those are soooooo awesome. It's hard to imagine which I would choose. This is so so cute. I would have the little washer say #1 and the bigger one say daddy. These are awesome. I can think of lots of people to give these too! Those are really great! I want like 8 of them! Do you need a special hammer or can you use a regular hammer to stamp these? These are my favorite things EVER!!! because I love your blog!!! 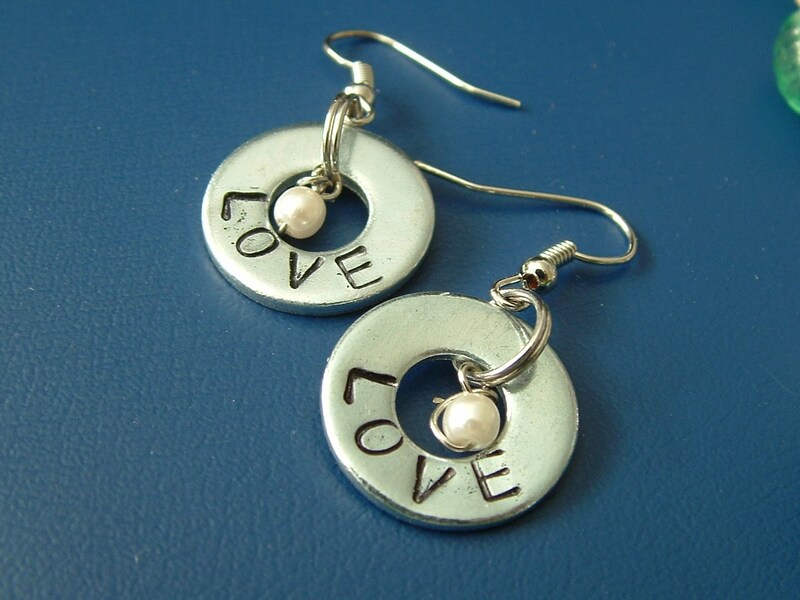 I love these and what a great idea to sell them pre-stamped! 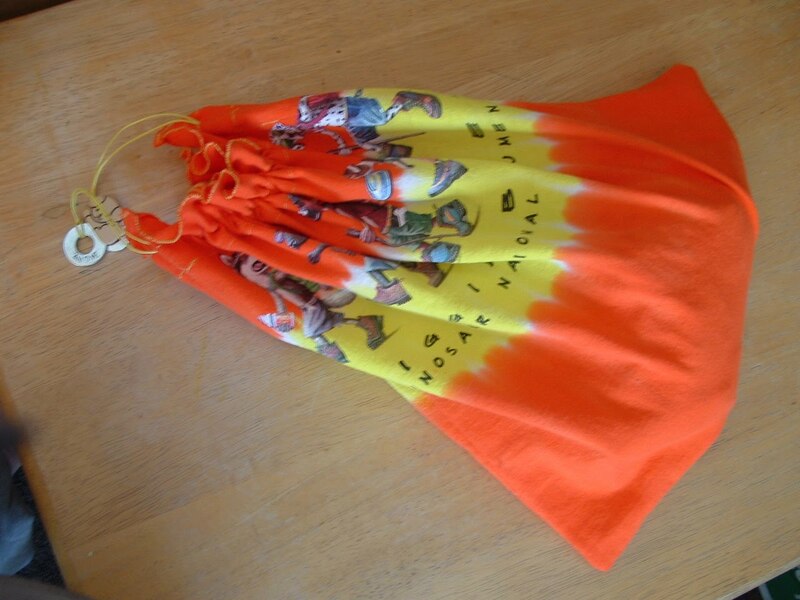 This is an ADORABLE giveaway! I'm already a follower! I love your ideas! These are great. I've been inspired to make these lately too and I love the grad idea! Now I just have to get my stamp set and I'm off and running! These are super cool! Thanks for the tutorial and giveaway! I'm a new follower. I'm so glad I found you. You have a great blog with wonderful ideas to do with my 2 little boys! So clever for father's day! My dad and FIL are both super handymen, so this will be perfect! Thanks for the tute! Love it! I may even try to make some on my own! 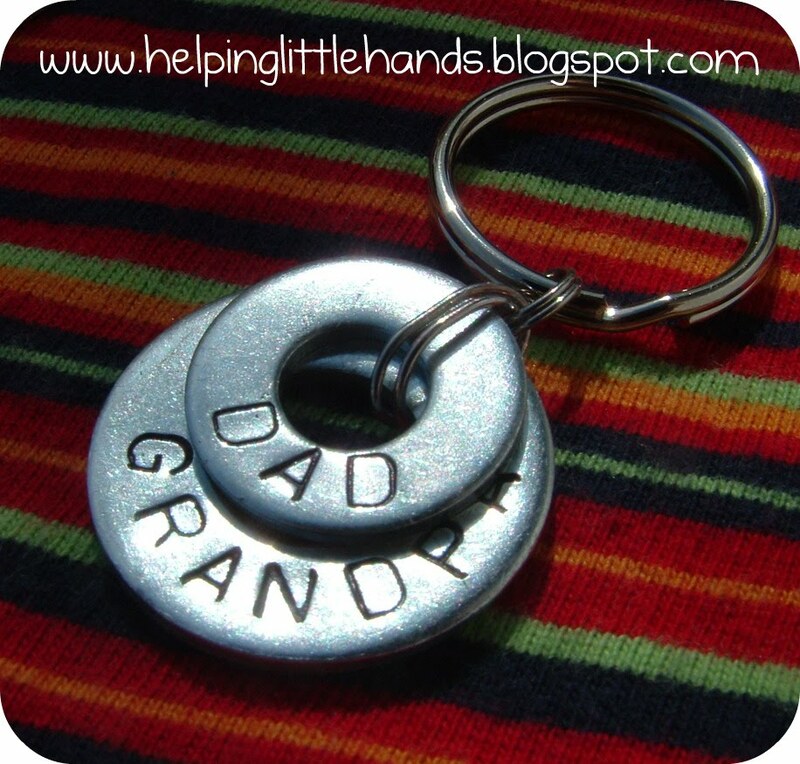 These will be great father's day gifts for our new baby's grandpas! Way Cool, I'm gonna make some of these! Yours are Neat!! I'm a new follower & looking forward to exploring your blog! I got here via U create! I love these! I really need to make some. I hope I win one, though, cause I tend to just add to my list of things to make, and then never get to it (he, he!!). So cute! We would love for you to link this up to the CSI Project's 'Hardware Store' Challenge that's going on this week. It's a fun challenge and Kate from Centsational Girl is our guest judge this week! What a great Father's Day gift idea! Hope I win. Thanks to you I made a quick run out to Harbor Freight this morning!! LOL $4.99 for the stamps - can't beat that!! i'm a new follower!! 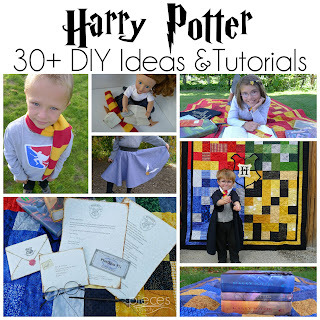 what a great gift idea, i can't wait to make some!! I am totally featuring this on my Feature Friday! I love it!! and... i am a follower! fun contest! 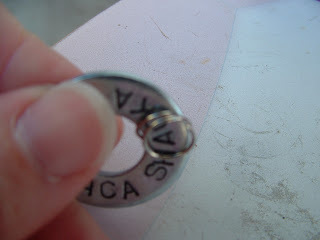 The stamped washers are really cool! Thanks for showing us how to make them. I just became a follower of your blog! Thanks for the neat ideas! Very cute! 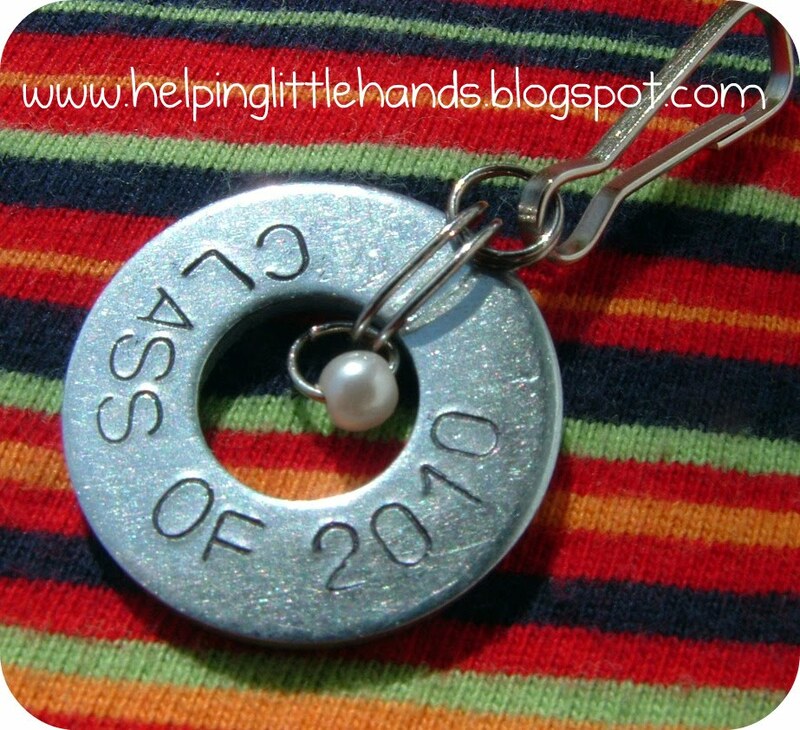 I wanna make some of these, great for Teacher gifts. Thanks! Oh my heck! I love these! 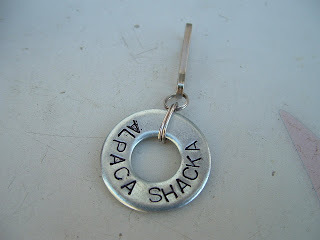 I would love one with a pearl and my name on it. Maybe "Shantel's Keys". Oh I love it! Love these. Such a cute idea!! Thanks for sharing. Thanks for the tutorial also a follower. My name is Cecilia, I'm live in Idaho. so cute!! love this idea! i am a new follower! These are awesome! I can't wait to make some myself!! Oh my word, this is too cute!!! I don't use the blogger following feature - but I just added you to my bloglines subscription, does that count? What a terrific idea! Thank you so much for linking with What are little boys made of? What a great idea!! I love this! Fun giveaway. & I became a follower! How cute! I wish I was creative, it looks like a pretty easy project but I have a feeling mine would never turn out so cute. I love this! This is perfect for Father's Day! Thanks for such a cute tutorial and for info on how to get the stamping set. Thank you!!! I'd love to win a pre-stamped set!! I would love to win one of these!! I love that you made it look so easy!!! I featured these on my Friday Favorites!!! 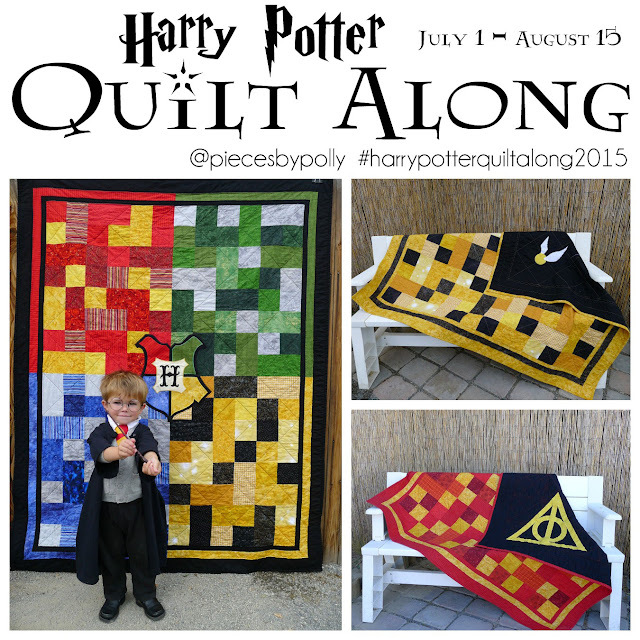 I would love to win this amazing giveaway. I have admired these for SO long but never had the confidence to make my own. Didn't realize the stamping set was so cheap, thanks! oh gosh. i love the dad/grandpa one. I want that for my father-in-law! he'd love it. what a great idea! this is perfect for my husband. he's a carpenter and will be celebrating his first father's day this year. how awesome would it be to have his and our son's name on one - VERY! You have inspired me!! This is such a great idea! I went to Harbor Freight to buy my stamp set last night!! I would love to have one of yours! !